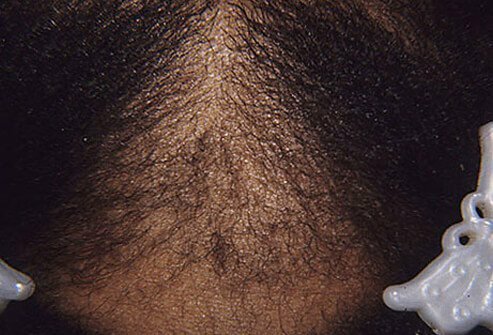 Is Bad Hair Related to Bad Health? Your hair is a product of your body and is produced by hair follicles situated in the deepest layer of the skin. It is composed mostly of dead protein and pigment. Changes in your body's metabolism can be reflected by changes in the quantity, thickness, and texture of hair. The anatomical location of the hair follicle plays a major role the variety of hair produced. 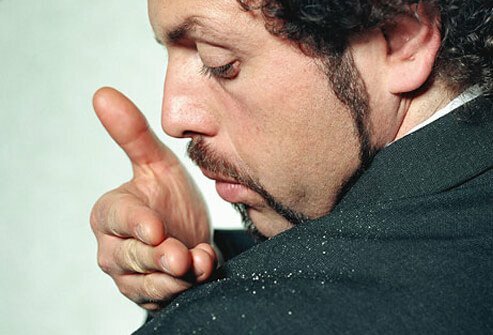 Dandruff is the name given to skin scale that the scalp produces. Since part of the function of skin, including that on the scalp, is to produce a semi-impenetrable horny barrier to protect us from the outside environment, a few scales are perfectly normal. Occasionally, if there is excessive scaling in the scalp, it may be necessary to change certain habits to diminish the amount of dandruff. Infrequent shampooing alone is sufficient to produce what appears to be excess dandruff. The accumulated flakes of skin produce an unpleasant appearance on the hair and clothing. All that needs to be done is to shampoo more often. 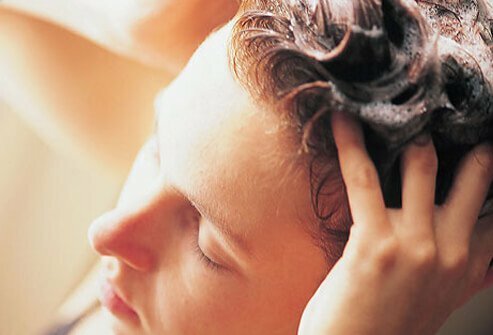 If the origin of the dandruff is a scalp disease, using a medicated anti-dandruff shampoo is often helpful. If this fails, it may be necessary to seek a professional's opinion. Probably the most common rash present in adults is seborrheic dermatitis. This disease typically affects the skin of the scalp, ears, forehead, face, and occasionally the mid-chest and/or back. 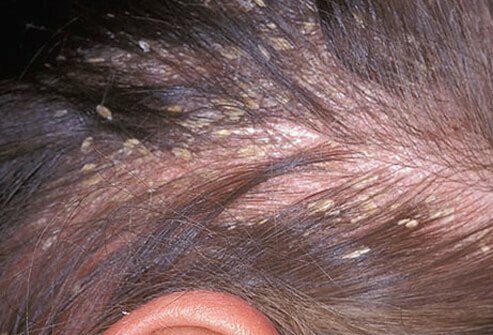 When the scalp is involved, the red scaling plaques produce excess dandruff. Even though this condition is exceedingly common, there is a poor understanding of its cause. Although it is incurable, it is easily treatable with a variety of safe and effective topical medications, including topical steroids, zinc pyrithione shampoo, selenium sulfide shampoo, topical antifungals, and tar preparations found in medicated shampoos. All hair follicles, including the 100,000+ on the scalp, exhibit a growth cycle. This cycle is composed of growing periods, quiescent periods, and regression periods. There are many factors that affect the lengths of these periods, including hormones, anatomical location, genetics, general health, medications, and perhaps the psyche. 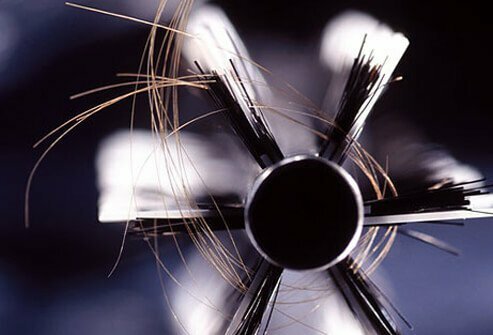 About 90% of scalp hairs are in the growing phase (anagen), and about 10% are normally in the resting phase called telogen. Each follicle grows and replaces its hair independently. Occasionally, a large proportion of the scalp follicles begins to grow synchronously and so are in the same phase of the hair cycle. 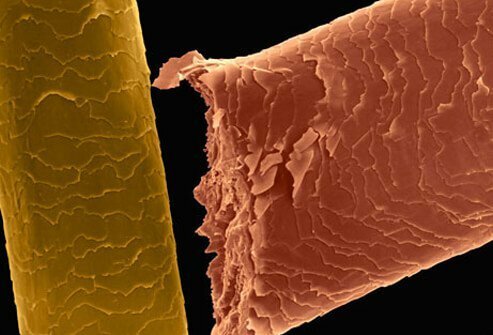 When this occurs and these hairs are shed at the conclusion of the telogen phase, there is extensive hair shedding. A variety of things seems to predispose to this "telogen effluvium," which include pregnancy, severe illnesses, certain drugs, and emotionally traumatic situations. Once the provocation resolves, the hair almost always begins to grow normally again. 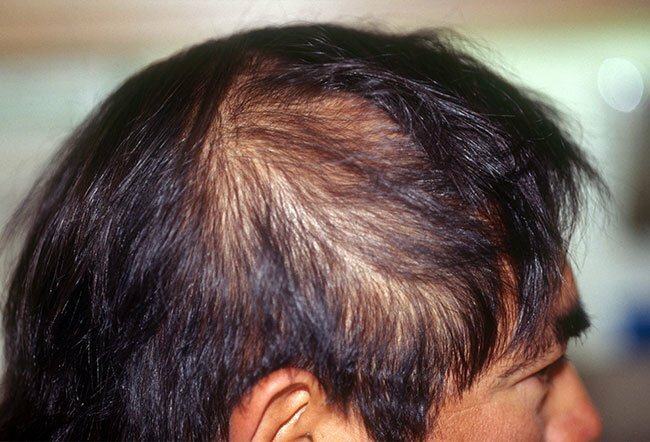 Alopecia areata is an autoimmune disease where the body attacks a group of hair follicles usually no larger than 1 inch or 2 in diameter. The hairless skin otherwise appears entirely normal. 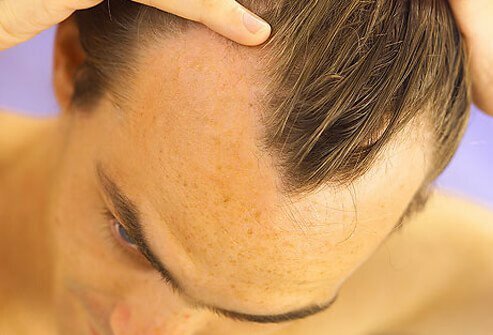 Though the condition usually resolves spontaneously, occasionally it can involve the entire scalp or even every hair on the whole body and be permanent. There is no reliable curative treatment, but frequently a steroid can be injected into the bald area to suppress the inflammatory component for a time. 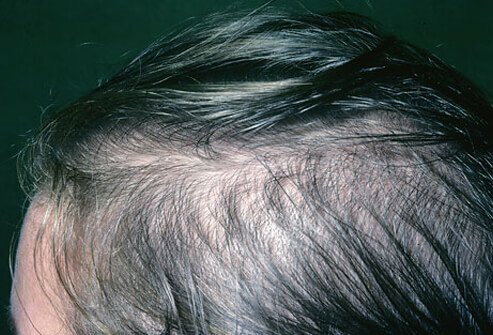 Normal hair thinning (resulting from follicular miniaturization) involving the temples, frontal hairline, and crown of the scalp, known as "pattern alopecia," occurs in almost everyone as they age. Its extent depends on genetic and hormonal factors. In women, this is usually seen after menopause. In men, it occasionally occurs as early as the mid-20s. 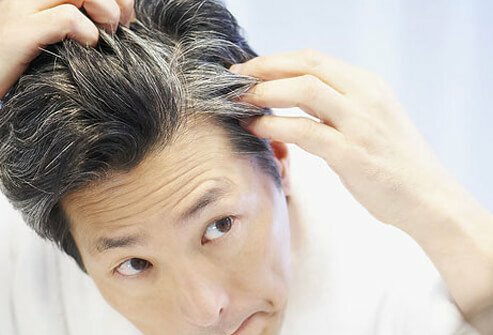 There is no cure for this condition, but topically applied minoxidil (Rogaine) and oral finasteride (Propecia) can promote hair growth in some patients. Hair transplantation is used to camouflage this type of hair loss. Female hair loss as opposed to that in the male can be a devastating cosmetic problem. Most of the time, classical female pattern balding is due to a genetic predisposition enhanced by hormonal factors. Rarely, it can be a sign of other serious medical problems. It may be necessary to visit a physician to determine if any specific cause can be found. Since hair is composed of dead protein, it is important maintain it correctly to optimize its appearance. Having luxuriantly abundant hair is a clue to general good health. Because hair does not repair itself, it is susceptible to environmental degradation by sunlight, dryness, chemicals, and physical trauma. An excellent haircut, avoiding chemical treatment, hats, and post-shampoo conditioners can improve and promote healthy-appearing hair. On the other hand, you can always shave the scalp, which for some men seems to work well. Along with appropriate exercise and sleep, a well-rounded diet will produce a healthy body, which is manifested in beautiful hair. Poorly conceived dieting and protein restriction may diminish and damage hair growth. There is no food that will provide all of the necessary nutrients for hair growth. 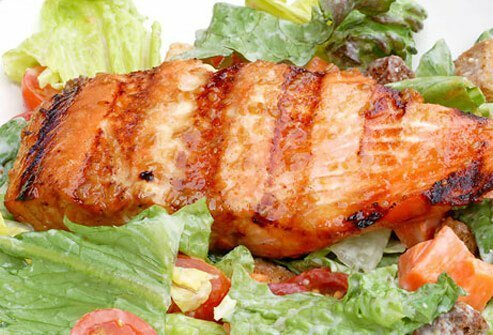 Some believe that diets high in fish, nuts, fruits, and vegetables are likely to be beneficial. However, there are probably no nutrients when given even in excess amounts that will substantially alter the health of your hair. Direct specific questions to professional dieticians. The loss of hair pigmentation is almost universal as we age. Early and localized loss of hair color can also be due to a number of conditions that ought to be diagnosable by most dermatologists. There are a number of ways we can damage our scalp hair in an effort to improve its cosmetic appearance. 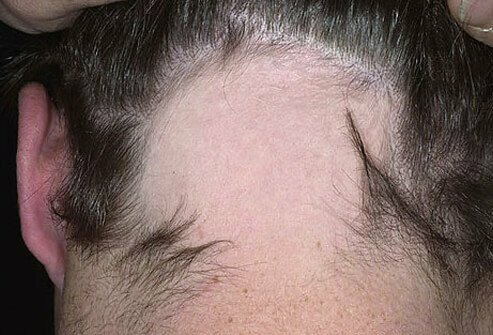 One of the most common conditions is called traction alopecia, which if persistent, can result in permanent hair loss. This occurs when chronic constant tension is applied to the hair shaft. This damages the follicle and inhibits hair growth. Certain hairstyles, such as tight ponytails, braids, and cornrows, are likely to produce this condition. Drying, coloring, straightening, ironing, combing, curling, twisting, and pulling can damage hair. Many drugs can inhibit hair growth. Since it takes about two weeks for a hair to grow from the root to the follicular orifice, it may be difficult to determine which drug may be responsible for suppressing hair growth. 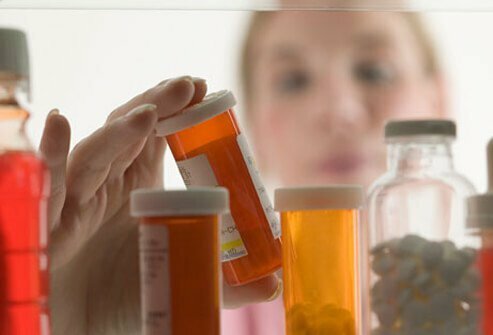 The following is a list of categories of drugs potentially likely to inhibit follicular function: anticancer drugs, anticoagulants, anticonvulsants, anti-gout medications, antithyroid agents, beta-adrenergic blockers, tricyclic antidepressants, and oral contraceptives. Does a Scalp Massage Help? Some people enjoy a good scalp massage, which may have certain sensual benefits. However, there is no medical benefit to be derived from them. There is no question that a chemical examination of hair does offer information as to past toxic exposures. The presence of highly poisonous heavy metals like arsenic and thallium found during hair analysis has been forensically useful. But care must be taken in collecting evidence, and the interpretation of the facts can be tricky. Analytical and Bioanalytical Chemistry: "Analytical Pitfalls in Hair Testing"
British Journal of Dermatology: "Malassezia, Dandruff and Seborrhoeic Dermatitis: An Overview"
Cleveland Clinic Journal of Medicine: "Diffuse Hair Loss - Its Triggers and Management"
Dermatology and Therapy: "Medical and Surgical Therapies for Alopecias in Black Women"
Dermatologic Clinics: "Pattern Hair Loss in Men: Diagnosis and Medical Treatment"
Headache: "Alternative Headache Treatments - Nutraceuticals, Behavioral and Physical Treatments"
Journal of Investigative Dermatology Symposium Proceedings: "Hair Breakage in Normal and Weathered Hair"
Journal of Investigative Dermatology Symposium Proceedings: "Healthy Hair: What is it?" Maturitas: "Managing Hair Loss in Midlife Women." New England Journal of Medicine: "Alopecia Areata"
Seminars in Cutaneous Medicine and Surgery: "Biology of the Hair Follicle - The Basics"
Seminars in Cutaneous Medicine and Surgery: "Clinical Approach to the Patient With Alopecia"